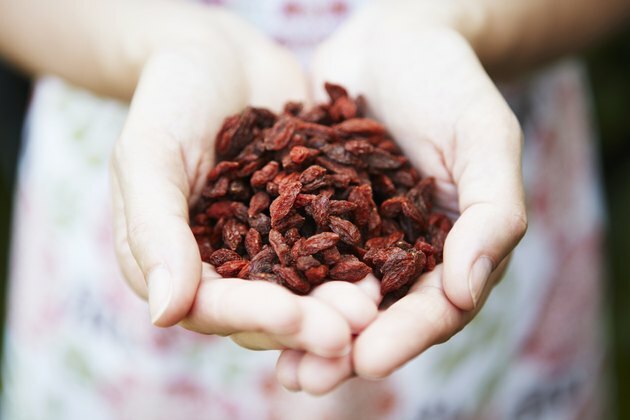 Goji berries, a fruit that comes from the Chinese Lycium barbarum plant, have been used as a traditional medicine for general health, and recent studies suggest there is real evidence for its purported benefits. Many types of berries offer beneficial antioxidants that protect the body against chronic disease, and goji berries may contain additional properties to improve eye health. According to a study published in May 2008 in the "Journal of Alternative and Complementary Medicine," drinking juice derived from goji berries has a positive effect on overall well-being. Study participants drank goji berry juice daily for a period of 15 days, reporting perceived levels of energy, quality of sleep and feelings of happiness. After 15 days, both the goji berry group and the placebo group reported higher levels of happiness, but the goji berry group also reported improved energy levels, lower fatigue, lower stress and improved digestive function. While these measures are subjective, the findings are statistically significant. The juice derived from goji berries can reduce the amount of damage done by ultraviolet radiation. According to a study published in January 2010 in "Photochemical and Photobiological Sciences," mice that consumed goji berry juice had a significantly reduced inflammatory sunburn response to prolonged simulated ultraviolet radiation. Researchers believe that some of the antioxidants found in goji berries are responsible for this protection, preventing the oxidative damage that would otherwise induce the inflammatory response. According to a study published in February 2011 in "Optometry and Vision Science," daily supplementation of goji berries over the course of 90 days significantly aids in the prevention of soft drusen accumulation in the eyes of elderly patients, an early warning sign of age-related macular degeneration. This exact mechanism behind this effect is currently unclear. Taurine, a compound found in goji berries, is also beneficial in slowing the development of eye conditions related to diabetes. Small, fleshy berries like the goji berry contain antioxidant compounds known as polyphenols that could protect against the development of cancer. These antioxidants fight against, diminish and repair cell damage that results from inflammation and oxidative stress from free radicals, preventing the likelihood of cancerous tumor development. Antioxidants like those in goji berries may also improve the effectiveness of chemotherapy by weakening tumor cells, reports a study published in 2008 in the "Journal of Agricultural and Food Chemistry."